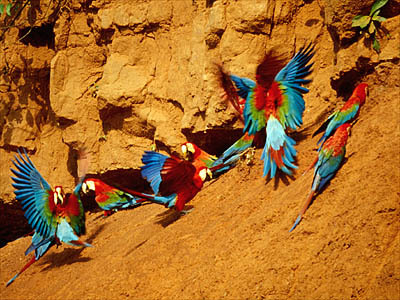 Red-and-Green Macaws at the clay lick, Manu, Amazon Rainforest, Peru. Photo: Mylene d'Auriol Stoessel. Luxury Amazon Tours, Travel & Lodges. These have been very busy days and I'm sorry if I could not write before. Lima was a very nice surprise: a big (around 8 million people) clean city, with wonderful smiley people. We started our tour with a great lunch at a typical restaurant, called Brujas de Cachiche, in Miraflores, and after that we visited very nice museums and archeological sites. The neighborhood of Barranco is an artistic place, where we crossed the Puente de los Suspiros (Sigh Bridge) making a wish without breathing. Saw the La Ermita church and the Park of Love. The Pedro de Osma Museum has a private collection of Peruvian artifacts, mainly paintings of the colonial era. The silver room is fantastic. All the museums carry collections of pottery and fabrics from the pre-Inca and Inca periods. It is amazing to realize all the civilizations these guys have had: Chavin, Paracas, nazca, Mochica, Huari, Chimu ... all starting way before Christ. I loved the mummy bundles: creepy, but pretty amazing. On the 25th we flew from Lima to Cusco, arriving in 1 hour. The Hotel Monasterio is part of the Orient Express Hotels, Trains and Cruises, and is beautiful. At the hotel we met Sheila, our local guide that took us to se the Museo Inka, right across the square. This place has mostly art pieces, lent from the museums in Lima. We walked the narrow streets of the old Cusco, with names impossible to pronounce. The city has 400 thousand people and lots of tourists. The old ladies are typically dressed and carry little llamas or little ship with them, so we can take pictures for a little fee. We visited Qoricancha, the Temple of the Sun, center of the Inca Universe. At the colonial times, the Spaniards took over the temple and built a church, or a convent, covering most of it. After the earthquake of 1950, the bell tower and lots of other parts of the church had to be restored and the ancient Inca wall was discovered. The Plaza de Armas is the downtown Cusco and it was once the Huacapata, the Incas' ancient central plaza. The cathedral is there, sitting on the foundations of the Inca Viracocha's palace. The construction of the cathedral dates from 1560. Lots of gold and silver everywhere, and the old altar is made out of cedar. Talking about cedar, all of them were taken for construction and the only left in Cusco is in the centre of our hotels yard. On August 26, the first thing I did was fall down the stairs and twist my ankle. No, did not go to the doctor and have it puffy and purple until now ... but it did not stop me from walking. In the afternoon we flew to Manu, in the middle of the forest, at the Madre de Dios Department. The plane runaway is dirt and the "airport" is just a thatched roofed bungalow, but our little 12 passenger Cessna plane arrived safe and sound. We have to be weighed and so has our luggage, before we board the plane. Our luggage (we packed lightly and left the rest of our stuff in Cusco) was carried in wheelbarrows to the narrow boats that took us all the way to Manu: almost 2 hours floating on the Madre de Dios River. Our cabin at the Manu lodge was called Charapita, which is a turtle. Monika and Kurt's is Maquisapa, the black spider monkey. It was very hot, around 35 degrees Celsius, with a lot of humidity. The only huge problem is the amount of cockroaches. Yuck!!! We did a lot of trail walking in Manu: on the first day we climbed a 144 steps tower up a very big ficus tree with a canopy platform (35m high). It was dark on the way back and our guide, Jose Antonio, showed us a big tarantula with her babies. Next day we got up at 4:45 in the morning, had only a coffee and took the boat to a clay lick where the macaws go to eat clay that is full of minerals, good for them to get rid of any toxins of the food they consume during the dry season. We first saw Blue Headed Parrots and then the Red and Green Macaws. We also saw Blue and Yellow Macaws, Dusky Headed parakeets, orange cheeked parakeets, Mealy parrots, a great black hawk, a lineated woodpecker, a chestnut ear tucanet, cobalt winged parakeets, tui parakeets ... We had pancake breakfast at the hide and stayed there for about 4 hours. Back to the lodge we encountered the Scarlet Macaws that live on those trees. Took a shower (we wished we could take showers every 15 minutes, because we sweat 24 hours a day. At 3:30 we left to see the tapirs ... but this story will have to continue later, because I have to get ready for our last dinner in Cusco. As I was saying, at 3:30 we left the lodge and walked for 2 hours, spotting Red Howler Monkeys and Black Spider Monkeys, tons of birds, different plants, mushrooms and bugs. The tapir clay lick has 10 little tents with mattresses and bed sheets inside. We had dinner there and installed ourselves into the tents. We could not talk too loud, use the flashlights, repellents, and could not snore, because, apparently, human snores sound a lot like the sound jaguars do. But it gets dark at 6 and we do fall asleep. At 7:40 a male tapir showed up and just stayed there, with its long nose full of clay, inside a big hole in the mud. A second tapir appeared later, but was a little shyer than the first. We left the hide right before 9pm, in the dark, and went back to our cabins and cockroaches. On day 3 Jose Antonio, our guide, tried to show us the Giant Otters in an oxbow lake, but they werent very cooperative. We saw many birds, instead, and bats, and turtles. On the way back we climbed 286 steps or 45 meters up to a platform on the top of a wonderful tree called Kapok, the biggest one Ive ever seen. It's like being on the top of the world!!! Rest during the warmest time of the day and left again at 3pm for a 2 and a half ours hike. We were at the bar early in the evening when Vanessa, a semi domesticated tapir, appeared on the steps of the dining room and ate apples and bananas from our hands. We heard that she has a new born baby, but never saw him. It rained during the night and the temperature dropped to 20 degrees. We needed jackets! In the morning it was not raining anymore and we went to Lake Blanco, to try to see the Otters again. No luck, but we saw little Saddle Back Tamarin monkeys, 2 black Caymans (endangered species) and many birds. And a big group of a pig like mammal that I am not sure what they were. For lunch we had a juice made of purple corn, called chichamorada. Very good. The Tamarin monkeys showed up at the lodge, and so did a bird that looks like a black turkey. And so did Vanessa, the tapir, looking for more bananas. From 6pm to 7pm we rode the boat looking for Caymans and spotted several of them. Well, the boat navigators spotted them ... which is not very easy, at all. On the 30th we went up the Madre de Dios River back to Boca Manu and the super airport. Boarded our Cessna 2088 Grand Caravan and were back in Cusco. After lunch our guide, Sheila, and the driver, Mario, took us to Sacsayhuaman, a ceremonial center turned fortress that was supposedly the head of the puma that forms the city of Cusco. It has zig zag walls made of huge stones (the bigger one weighing more than 300 tons= perfectly rounded and fitted to each other. 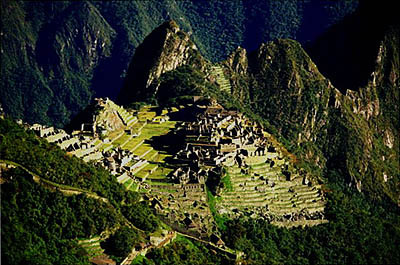 The construction started in 1440 by Inca Pachacuti and lasted 100 years. After that we went to Qenko, which was a sacrifice place, with altars inside caves. A 10 minutes hike, Sheila said, to see the site. We walked for 1h and a half. Went then to Salapunco to see more caves and sacrifice altars. Down to the Sacred Valley of the Incas we stopped at a place where they show alpacas, llamas, vicuñas and guanacos, all from the camel family. We fed them, took pictures, saw how the wool is processed, weaved and died, observed some natives weaving and did some shopping. Stopped again for a view of the city of Pisaq, the first one in the valley, and went to the hotel Luna y Sol in Urubamba. On Thursday, the 31st, we visited the town of Pisaq, its citadel ruins and the market. Of course, many steps up and many terraces used for agriculture, by the Incas. Most of the houses are made of adobe bricks: clay, water and fibers. The Incas used adobe bricks too, but instead of water, they used liquid from a certain cactus. And human or llama hair, for fibers. It was stronger. We had lunch at the Hacienda Huayoccari, a private farm that opened its doors for tourism. Nice preserved Spaniard house, very pretty. In the afternoon we visited the Ollantaytambo fortress, also from the Inca period. On the next day we took the train from Ollantaytambo to Machu Picchu Pueblo, or Aguas Calientes. When one train arrived in Ollantaytambo from Machu Picchu, we saw the porters carrying all the stuff they use on the Inca trail: very heavy camping gear. There is an Inca Trail Race every year and last year one of the porters won it, running the 36km (most of it up hill) in 5 hours. The train from Ollantaytambo to Aguas Calientes takes 1h30 and the Valley turns into a gorge, with the Urubamba River running through it. The view is fabulous. From Aguas Calientes we took a bus to Machu Picchu: an 8km zig zag road with a lot of cliff viewing. Unfortunately, Monika got sick (some kind of food poisoning, we think) in the train and wasnt able to appreciate the trip ... well maybe that wasnt such a bad thing: the road was a little scary. We stayed at the Sanctuary Lodge Hotel, right on the gate of Machu Picchu. The hotel was built before Machu Picchu became an Archaeological site and is just beautiful. Monika and Kurt had a post card view of the site, and our apartment had a balcony to the garden. There are 300 species of orchids in this area. And theres a type of bear too! Monika relaxed during the afternoon and the rest of us had lunch and went for our first view of Machu Picchu, climbing to the Guards Gate. The best way to describe what we felt, is confessing that both Marco and I had tears in our eyes, when we saw the city from the top of the hill: it is breathtaking. It's like finally touching something that you are not sure that really exists ... very special. We walked a little on the original Incas' trail, paved with flat stones and saw, from below, where the Sun Gate is. On the next day we got up early and went up to the Guards Gate again, to see the sunrise on the site. It was misty and when we arrived to the top, the clouds broke and the sun rose above the mountains, giving us an marvelous view of the city. There are several llamas that live there and are everywhere, posing for the many photographers. By the time we left, the mist was back and Marco said that it might work like those telescopes that you find in certain places: you put a quarter in it, and everything becomes clear again. Later our guide, Sheila, took us on the lower paths, to see the residential area, the palaces and temples. It was crowded, but she always managed to find exclusive places for us. Hot and sunny day. We were back in the train at 3:30, going to Cusco, watching from our windows the valley, the people working on their corn crops, propagandas for the mayors´ elections on every wall ... There was dance and a fashion show in the train. After 3 hours we arrived in Poroy, where the driver pick us up and took us back to the Monasterio Hotel. We headed again for the Sacred Valley, but stayed in the highlands. We visited a town named Chinchero and saw a weaving demonstration at the Center for Traditional Textiles of Cusco. Pretty interesting the way they are trying to preserve the art of weaving, teaching and passing it to younger people. The Chinchero Indian Market was a nice treat: very colorful and full of people. We tried sweet popcorn and saw people trading goods for goods. The Moray Archaeological site, close to Maras, has circular agricultural terraces that were built by the Incas in natural sinkholes on a limestone plateau. It was mainly used to acclimatize certain plants. Maras is a little colonial town with dirt streets and a big central Plaza. The salt pans of Maras are pretty close and interesting: a salted stream comes out of a spring underneath a chapel and is directed into several little terraces where it dries and can be extracted. On Monday we took the train from Cusco to Puno. The Andean mountains are beautiful, towering over the valley of the Huatanay River. The train stops for 10 minutes at La Raya, the highest point on the route, and, of course, theres a church and souvenirs for sale. Altitude 4321m above sea level. There are alpaca, llama and sheep farms everywhere and, again, the houses are all made of adobe bricks. The roofs are aluminum, because ceramic becomes very expensive outside Cusco. A lot of rock is used for fencing lots and house bases. We had lunch and tea in the train. And watched a fashion show, again, with pisco sours in our hands. The arrival at Puno station was around 6pm, already dark. Our hotel, the Libertador Titicada, is a monstrous white elephant building on the top of a hill on a little island north of Puno. It looks a lot better from the inside. Yesterday, September 5, we woke up to an amazing sunrise, at 5:20 in the morning. Puno perches in the southeastern highlands, or Altiplano, at 3870m above sea level. Its dry and chilly. The population descends from 2 very ancient Andean ethnic groups: the Aymara and the Quechua. After another early breakfast we climbed down the stairs to the little hotel pier on Lago Titicaca. The lake is the worlds largest high altitude body of water, with depths reaching 284m, and more than 8500 square km in area. A boat was waiting for us with teenagers pilot Ubaldo and co-pilot Aron. Riding through a narrow channel of reeds we arrived at the Islands of the Uros. The Uros Indians built forty something island-like packs of floating totora reeds and some groups actually live on them, with their crude outdoor kitchens, mattresses also made of reeds, solar panels and black and white TVs. At Isla Tupiri (it means floating in Aymara) we met Marisa, a nice looking Indian, who showed us how they build the island. The totora reeds are also a source of food and providers of fluoride (every Indian has beautiful teeth). They have rosy chicks and the ladies have beautiful long black hairs on braids decorated with colorful pompons. Taquile was our next destination: an island that has been inhabited for over 10 thousand years, with agriculture being introduced about 4000 BC. All is terraced and planted with potatoes, corn, broad beans and quinoa. The 1200 inhabitants, including the men, are mostly weavers and knitters of fine alpaca wool. Their clothes are bright and quite elaborate. We went up one side of the 1km by 7km island and down the other: more than 550 steps descending to the dock, sharing the path and steps with lots of tourists, cows and knitters. Had lunch in Llachon, on the tip of the Capachica Peninsula and were back in Puno by 5 in the afternoon. Today we decided to take it easy and stayed at the hotel. The plan was to go to Copacabana and to the Sun Island, but due to a strike, Copacabana was cut out. The idea of being stuck in a bus and then in a catamaran for the whole day didn't inspire us too much, so we took a little vacation from our vacation. 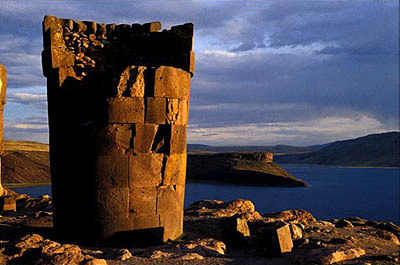 Chullpas of Sillustani, on the shore of Lake Umayo, Lake Titicaca. On September 7 we woke up for one more beautiful sunrise, had breakfast, finished packing and were out of the hotel at 8:30. On the road we saw many Bolivian gasoline trucks and our guide informed us that Bolivian gas is a lot cheaper than the Peruvian gas. The road, by the way, wasn't the best in the world. It was made by the army and, apparently, they are not the best road builders. We drove to Sillustani, surrounded by the Umayo lagoon. The chullpas found there are large funerary monuments built by the Callas about 2000 years ago, and some later, by the Incas. They are circular buildings more than 15m high with a challenged architectural design, being the diameter of the base less than the top. There's an island where about 100 vicunas are kept, for protection. An old lady had a baby vicuña with her and let Monika and I feed the animal with milk in a bottle. After that we proceeded to the Great Temple of Pukara. It was where the origins of Andean culture in the Altiplano were discovered. There are terraces and tombstones. The most impressive, for me, was the rock behind it a dream come true for climbers! The city itself is small and poor. The catholic cathedral takes half of the city. The museum was closed and we could not visit it. Back to Juliaca (60km) from Pukara) we stopped at the airport to check-in and went to lunch. Back to the airport just in time to board the plane. We arrived in Arequipa before 5pm and our guide, Marcelo, his boss, Gladys, and the driver, Beto, were waiting for us. We stayed at the Libertador Arequipa and have huge suites. And a huge Jacuzzi, too. For dinner I had cheese cauchi, the best cheese soup I ever ate. And we did a pisco tasting, after dessert. In the morning of the 8 we left around 8am, stopped at an ATM for money and at a store for chocolate and flavored water, which is good for altitude sickness. There was a woman in front of the store with a hawk on the top of her head. Poor thing. On our way to the Colca Valley, Marcelo told us about lines that were made by Chinese tractors on the hills, to be irrigated and cultivated. Lot money was spent and the project didnt work (it too dry), even causing and ecological disaster, due to the destruction of the natural grass. It is called the Fujimoris Lines, made by ex-president Fujimori. Passing below the Chachani volcano we arrive at the Pampa Canahuas, a national reserve for vicuñas, llamas, alpacas and other indigenous species. It is called Reserva Nacional Salinas y Aguada Blanca since 1979, and the project is to save vicuñas from extinction. In Viscachani we left the main road. On a 20 minutes stop for baño we took pictures of a great volcanic formation and watched a baby alpaca turn over a sugar dish and eat as much as she could from the top of the table, until somebody scooped her up and took her away from there. Arriving at the Ventana del Colca we have the first glimpse of the great Colca Valley. A hiking of 300m took us to visit the Mollepunko Caves with its 5000 years old petroglyphs and paintings. The wind was strong and cold. We saw alpaca farms everywhere. The Castillos are beautiful castle-like rock formations and we stopped in Callalli to see them and the ugliest church I've ever seen. The altitude is 3800m above sea level and does not permit agriculture. We had box lunches sitting on the main plaza in Sibayo, on the banks of the Colca River, one of the most traditional pueblos in the valley (colonial architecture and straw roofs). Passing through Chivay we arrived at our hotel, El Parador del Colca: it is a cute 7 bedrooms hotel, that was just bought by the Orient Express line and will be developed next year. Cesar, the manager, invited us to help on feeding their 5 little six months old alpacas with milk bottles. We had a great time. On the 9th we were up at 5:30, had quinoa for breakfast (is one of their great do-everything-with-it cereals) and were out at 6h30, to see the condors. Mile after mile we passed pre-Inca stone terraces climbing the hills along the Colca River. There were loads of people, bulls and donkeys working with preparations of the land for potatoes, corn, barley. They work on reciprocity: everybody helps everybody. The Colca Canyon is the second most profound in the world, and twice as deep as the Grand Canyon. The road is dirt and passes through 2 tunnels excavated on the rocks one of them being very impressive. The Andean condors take advantage of the strong winds to soar into the sky. At the Cruz del Condor, an observation point, we saw at least 6 of them. The altitude there is 3500m above sea level. On the same morning we visited Cabanaconde, a pueblo of Quechua origin, and the Mirador de Tapay, from where we could appreciate the small pueblos of Tapay, Cashnihua, Malata and San Juan de Chucco, all hanging on the canyons hillsides. In the afternoon we soaked on the Hot Springs of La Calera. Nice and hot. On Sunday, the 10th, we had breakfast on the patio and decided not to do the hiking that was planned for us. Going back to Arequipa we stopped at the Mirador de los Andes: altitude 5025m above sea level. We saw ice, wish rock formations called Apachetas, Vizcachas, a long tail rabbit, from the chinchilla family, and yaretas, a moss-like-plant used as firewood. It grows 1cm/year on very high places, above 4000m, and its sap is for used rheumatism. We also saw the Mismi, a mountain told to be the origin of the Amazonas River. Back to Arequipa we had lunch at the hotel and went downtown for a stroll. Dinner at a restaurant called Zig Zag: we ate a trio of Alpaca, Beef and Ostrich meat, made on a hot stone. On our last day in Arequipa we visited the city and its outskirts. Arequipa is called the White City, because of its bricks made of compacted volcanic ashes. Pretty interesting. After all, the city is surrounded by volcanoes: The Misty is extinct, but the Chachani is dormant and snow covered. A while ago the volcano next to volcano Ampato erupted and the snow cap on this last one melted. Thanks to that, the best preserved mummy in the world was discovered, and named after the guy who found her. Her name is Juanita and she would be around 13 years old, when was sacrificed by the Incas, to calm down the spirits of the volcanoes. We visited her in a very organized museum, downtown. They have earthquakes, too: the last earthquake in Arequipa was in 2001 8.1 on the Richter Scale, and the cathedrals tower fell down with its bells. It was completely destroyed and made a big hole on the roof, falling down just meters from the Belgium pipe organ. Textiles are the main industry and the best Alpaca weaving industries are there. It is the second most important city in Peru, with a population of around 1000 people, counting the Shanti towns, where theres no electricity or main facilities. We also visited the cathedral, a Franciscan church, the Santa Catalina convent, a mill, and had lunch at Tradiciones Arequipeñas. At 5h25 we boarded the plane to Lima. And at 2h30 in the morning of yesterday, the 12, we were aboard the plane to Canada. THE END! Hope you enjoyed the reports! Marco will be probably working on the website pretty soon, and I'll let you know whenever it is ready. Now he is back to work and I have a lot of laundry to do!